In our 5th annual survey, WWBPA volunteers counted 360 bicyclists and pedestrians at 5 locations around the train station on Wednesday September 16, 2015 between 5-8pm. Last year the count was 343, but the numbers are not directly comparable, since we counted at only 3 locations last year. Comparing the same locations at the same time slots, biking and walking decreased 5% over last year. At least we had beautiful fall weather again this year. Once again we participated in the National Bicycle and Pedestrian Documentation Project, an effort to accurately and consistently measure usage and demand for bicycling and pedestrian infrastructure. Traffic along 571 in downtown West Windsor flowed freely throughout the observation time, except for 3 minutes at 5:30pm – this is consistent with last year, which congested for 4 minutes at 6:00pm. Honks were also consistent at 11 this and last year, while the number of semi trucks rose by 2 to 7 this year. One of the honks was to encourage a right turn on red from Wallace to 571, which both the honker and honkee proceeded to do, illegally – an additional sign at the corner would aid in getting the message out. I was honked at from behind a few weeks ago while waiting on my bike at Wallace, but just pointed up at the No Turn On Red sign overhead. This post was published as a Letter to the Editor in the West Windsor Plainsboro News December 16, 2011. In response to Lucy Vandenberg’s letter in the West Windsor Plainsboro News December 2, 2011, WW Transit Village a Model for State. As I expect Ms. Vandenberg would agree, the Transit Village is a good start, but more needs to be done to achieve the benefits of Smart Growth. It’s not enough that the Transit Village will “make it possible for people to get out of their cars and walk, bike, and take the train to their destinations.” We must be able to safely walk and bike to and from the Transit Village. It’s not enough to have compact development – we need a grocery store within walking distance, like the Acme that used to be in downtown West Windsor. Land use law and/or policies must require diverse uses – we need more than banks and real estate offices downtown, so that people have a variety of walkable destinations. It’s not enough that compact development could be environmentally beneficial – we need specific open space preservation tied to specific dense developments like the Transit Village. It’s irrelevant that other space in New Jersey is already preserved. It’s not enough to have Smart Growth policies for land use – transportation policy must support land use policy, by implementing the flexible standards in the New Jersey Department of Transportation’s (NJDOT) Smart Transportation Guidebook. 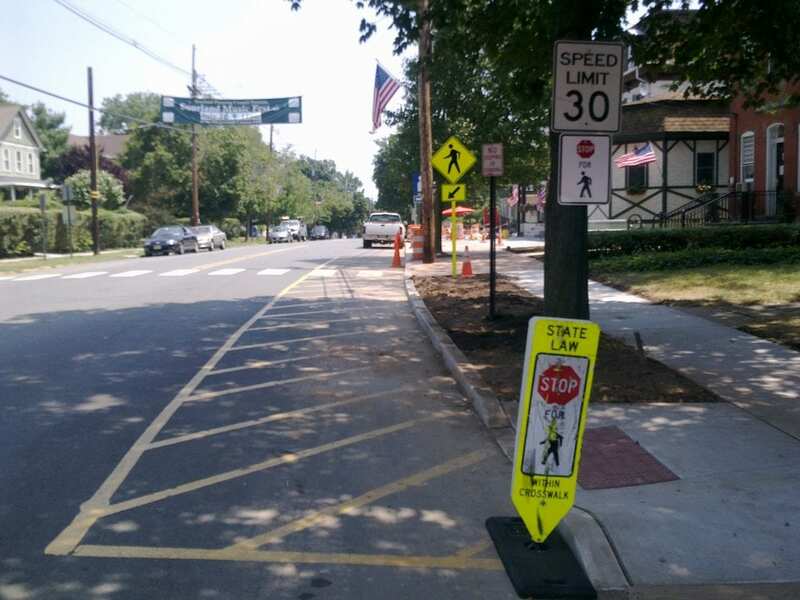 It’s not enough that NJDOT and West Windsor Township adopted Complete Streets policies – Mercer County must also adopt the policy, which requires roadway improvements to support walking and biking. Otherwise major roads like CR 571 in downtown West Windsor are subject to expensive but counter-productive “improvements” that don’t meet the the township’s goal for “pedestrian-friendly, village scale development.” There’s nothing pedestrian-friendly about a wider road with 30% more cars going 45mph, with no place to safely wait in the middle when crossing. 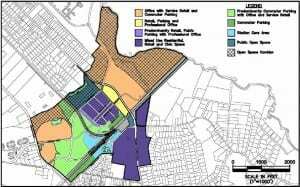 The Rt 1 Regional Growth Strategy is not enough, since it doesn’t sufficiently support redevelopment in Trenton and New Brunswick, the two already-compact but underutilized “developments” anchoring the region. With the right policies, much of the region’s growth could fit into Trenton and New Brunswick with far less environmental and traffic impact. Without supporting our cities, the strategy’s Bus Rapid Transit system will effectively encourage sprawl in outlying areas, contrary to its stated goal. Respectfully, it’s wrong to promise reduced congestion by implementing Smart Growth, even with Smart Transportation and the Bus Rapid Transit system. Like water, the transportation network balances itself as people choose to walk, bike, drive, or take the bus or train, depending on the cost and convenience of each. If there is less congestion, people will switch to driving until there is enough congestion to make it better to take another way. The Transit Village is a good start, but doesn’t exist in a vacuum. We need complementary supporting policies to achieve the benefits of Smart Growth. If Smart Growth just means new and denser development, then it has already failed to achieve its goals. 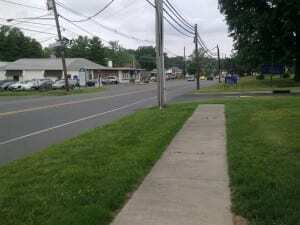 The WWBPA responded to the county’s proposed CR 571 Main Street design recently, maintaining that it is unsafe for everyone: motorists, bicyclists and pedestrians alike. In the past 10 years, two pedestrians were killed on this stretch of roadway (2004 and 2005), while no motorists were killed. 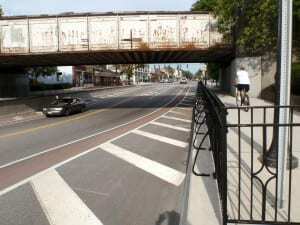 A 17-year-old motorist was killed in 2006, however, just west of downtown Princeton Junction, when she lost control of her car on the curve coming off the bridge over the train tracks. The proposed wider-straighter-faster design does nothing to address these safety issues. Instead, it preserves the current 45mph design speed and 40mph posted speed limit. Drivers don’t respect crosswalks when they have to slow from high speed, and the proposed design does nothing to provide pedestrian refuges in the center of the roadway to promote safe crossing. The design also features a new two-way center left turn lane (TWLTL) that studies have shown to be unsafe; AARP calls them “suicide lanes.” One study even showed that artificially lowering the posted speed limit, but not the design speed, caused an increase in crashes. 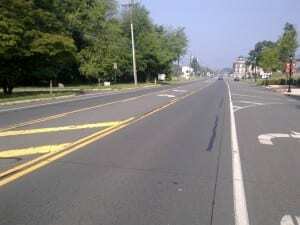 Here’s a picture of Hamilton’s SR 33 that most resembles what is planned. The 45mph design speed is simply not appropriate for the pedestrian friendly Main Street that our Redevelopment Plan envisions. 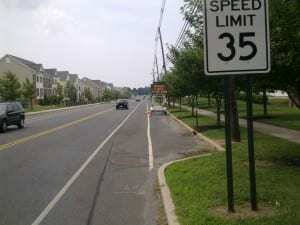 A survey of other Mercer County towns shows that Princeton, Lawrenceville, Hightstown, Hopewell and Pennington all have 25 – 30mph speed limits on their Main Streets. Why not in West Windsor? The WWBPA is not just opining, and we’re not just complaining – our response, and our recommendations based on the December 2009 Public Review, are founded on research and guidelines from the New Jersey Department of Transportation. We are recommending constructive, Complete Streets alternatives to remedy the safety issues and make a Main Street that we can all be proud of. The current design shows why Mercer County should adopt a Complete Streets policy to complement the state and West Windsor township policies – our transportation network needs jurisdictions with consistent policies to benefit our taxpayers. Thanks to everyone who has gotten involved to support our position! We appreciate all of you who have signed our petition at the Farmers’ Market, or who have contacted the Delaware Valley Regional Planning Commission, which recently conducted public outreach on this and other federally-funded projects. More help is needed. Please contact our public officials to support our position. With a lower design speed and pedestrian refuges, our senior residents can cross Route 571 safely to the new Rite Aid, and our children can cross Route 571 safely to the new ex-Acme shopping center, as well as to the high school. And our teenage drivers should be able to keep control of their vehicles when going more slowly. Everyone benefits. 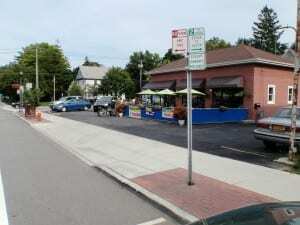 East Aurora, NY is a pleasant town outside Buffalo with a Main Street that might offer West Windsor a few pointers. See the photos and color commentary, and let us know if you think these design elements might work for our Route 571 Main Street! 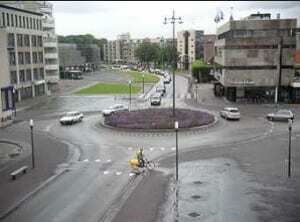 Main Street, also US 20A, is a busy road on a Friday just past 5pm, but the roundabout seems to keep the cars moving. 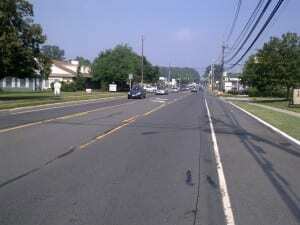 From this western end, Main Street extends east a little over a mile, similar to West Windsor’s Rt 571 from the tracks to about South Mill Rd. The roundabout has stores and driveways, including fast food outlets. Looking east from the roundabout, notice the center two-way left turn lane, a key feature of the Route 571 design. Also notice that the bike lanes are maroon-colored pavement, to make them stand out, and that there is on-street parking on both sides. A new Rite Aid is on the left (familiar?) and just off camera on the right is the Sunoco station (might feel like home already! ), below. 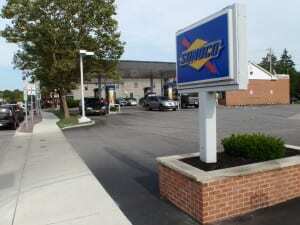 Note the nice street sign for the Sunoco station. East Aurora is known for a number of things, including being the home town of Millard Fillmore (he was a U.S. President, if you were wondering), the birthplace of Fisher-Price toys and a center of the 19th-century Arts and Crafts design movement. They take their signage pretty seriously as a result, though they apparently couldn’t get Sunoco to redesign their sign to fit the Arts and Crafts style font that graces many other signs around town, as well as their town’s web site. Moving east, notice this building, currently a bistro (it’s been a number of other things in the 7 years we’ve been visiting regularly – our daughter’s camp is nearby). They have taken away parking spaces in front of their building to put in an outside dining area. Nice! 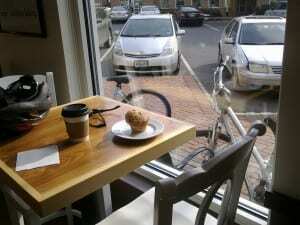 There are also a number of bikes parked in front of the dining area. I noticed a lot of bicyclists around town, including a spandex-clad road warrior in the bike lane and more casual bicyclists riding on the sidewalks. Moving east, the road narrows to 2 lanes, but still includes colorized bike lanes and on-street parking. This shot is in front of the post office, so you’ll notice the drive-up mailbox, but also the attractive sidewalk and lamppost planters. Hidden behind the sidewalk planter is an artsy bike rack and a bench is just visible behind. Perhaps the road sign gives us an indication of what it takes to get a main street like this? Still moving east, this picture shows the railroad underpass. Notice the bicyclist on the sidewalk, and the people in the car waving to him; people are very friendly in East Aurora. The bicyclist and I had a nice chat, since he was very interested in why I was taking so many pictures. 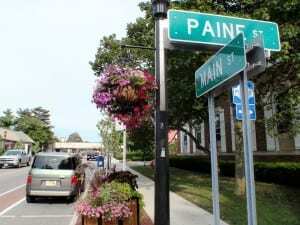 He alluded to some of the controversies that the town went through to get their main street, including a big debate about the number of on-street parking spaces (the snide comment about the street signs wasn’t just my editorializing). He couldn’t entirely grasp why I liked it so much. Please leave a comment below with your opinion! Just under the railroad tracks and past an intersection, a two-block traditional downtown area has stamped pavement colored to look like bricks. This space includes the center left-turn lane even though there are no driveways to turn into, and maintains the bike lane (nary a bike symbol, sigh). But what is really interesting is the ADA compliant on-street parking on the right and across the street, where the sidewalk is ramped up at the two ends to meet the curbed sidewalk area. There were several of these facilities along the roadway. Of course West Windsor’s main street is not planned to have on-street parking, so this type of ADA parking would not be applicable. What is significant is how they solved the issue of making an extremely wide roadway pedestrian-friendly by using the stamped pavement. It’s not exactly the same, but a little similar to using these sorts of treatments in the shared spaces of West Windsor’s transit village: The message of pedestrian-priority space is conveyed. 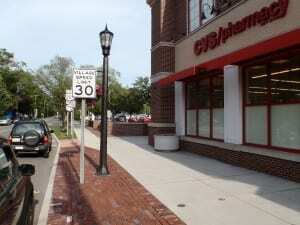 Just past the bricked area, the roadway changes back to two lanes plus on-street parking again, and the CVS pharmacy anchors the eastern end of Main Street. 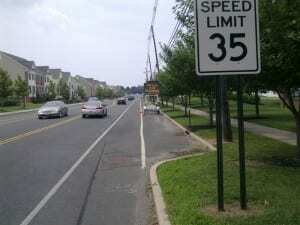 Note the speed limit sign: 30mph, much more pedestrian-friendly than the proposed 40mph in West Windsor’s design. What might be improved in this design? There is a lack of tree canopy, but that’s likely because the trees are all newly planted. It would be interesting to know the history of why the two-block bricked section is so wide. Google Street View shows it with asphalt still during construction, but perhaps there used to be angle parking, or way back perhaps even a trolley line from Buffalo. Another issue is the bike lanes. No casual bicyclists seemed to be using them: The group of teenagers, the dad pulling a kid-trailer, the various others were all bicycling on the sidewalk. This is likely because the bike lanes aren’t very wide, and place bicyclists between the heavy traffic and the parked cars, right in the way of opening doors (the “door zone”), which is dangerous. Hope you enjoyed the tour. Let us know what you think! 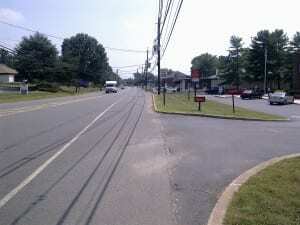 The pictures are of various town’s main streets in Mercer County. Just match the town with the picture! Then look at the illustration for West Windsor’s proposed Rt 571 Main Street design, and identify which town West Windsor’s main street will most resemble when it’s implemented. Note that 1 town has 2 pictures, since their main street is parallel to another road that carries more traffic. Last, here’s the illustration from the Rt 571 design – which town will West Windsor’s Main Street most resemble? Sign in to comment, or send us an email at wwbikeped@gmail.com. Answers will be posted in a few days! What Makes a Main Street Work for Everyone? 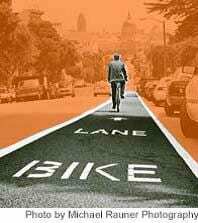 Bicycle and pedestrian friendliness doesn’t have to be a win-lose battle between competing interests, but can be a win-win for everyone. The right design balances safety, capacity and livability for motorists, bicyclists and pedestrians in a way that makes all groups comfortable sharing the space. Notably, the roadway design should make motorists comfortable traveling at the posted speed limit, which should be 35mph or less so drivers will stop for pedestrians in a crosswalk. 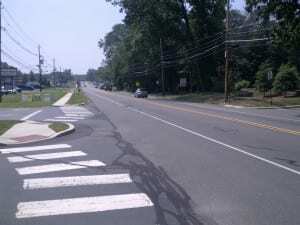 One nearby example of pedestrian friendliness sometimes discussed is Mercer County Rt 526 in Robbinsville, where recent development included all the design items to make a pedestrian friendly area. Does it work? Check these pictures – they apparently need a lighted sign board to remind drivers re: the speed limit, and to watch for pedestrians. 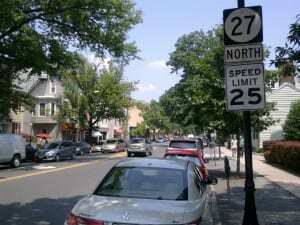 Why might the roadway design not support the speed limit? The current design calls for adding a center left turn lane, sidewalks and a bicycle-compatible shoulder, maintaining the existing design speed (45mph). The problem is that the combination of same design speed, the additional center turn lane and roadway widening, but no pedestrian refuges halfway across the road will make it harder, not easier, to cross the street. Essentially, there will be 30% more cars to dodge when crossing, which will be going faster than today, since they wouldn’t have to slow down for left-turning vehicles (which will be in the new center turn lane). 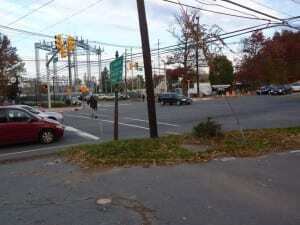 In our view, Route 571 is already too hard to cross, and this design will make it worse. Please join us in adding your comments to the DVRPC by following the instructions on their web page. 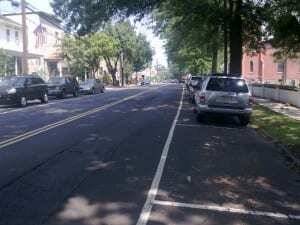 The stated goals are for a bicycle and pedestrian friendly main street, but the design details do not support the goals, according to the NJDOT Smart Transportation Guidebook. On the plus side, the recommended changes will save money and most importantly give us a Main Street we can be proud of, while still increasing capacity. Check out the innovative pedestrian crossing in New Brunswick: Not only does it blink when a pedestrian is crossing, it shows the speed of approaching traffic. It’s even solar-powered. A possible solution for Sherbrooke and Route 571? 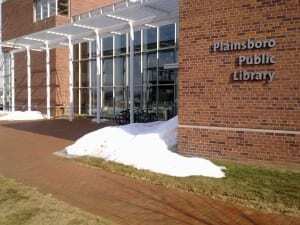 The big melt was on, temperatures were rising into the 60s, school was out for teachers’ professional development, and student bicyclists flocked to Plainsboro’s Village Center. During a short stop on a bike for coffee and a muffin on that day just over a week ago, a very interesting phenomenon was observed: the numerous bike racks in the back parking lots were completely deserted. Not to worry, the benches in front had bikes locked to them, and the bike rack next to the entrance of the new library was packed! Nice job, Plainsboro! We in West Windsor look forward to our revitalized Main Street Route 571 being able to attract our fair share of bicyclists out for a nice ride. In the meantime, there’s a lesson for all: if bike racks are visible (so generally, near entrances), they’ll be used much more than if they are hidden away. “Small business owners can be the most vocal opponents of traffic calming projects because they fear losing revenue due to changes to the streetscape. Some research suggests that traffic calming projects can actually improve business conditions and raise revenues for small businesses (Lockwood, 1998). 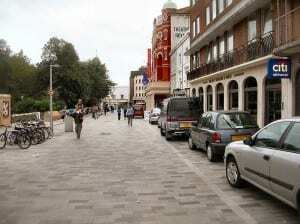 Over 65% of the merchants surveyed supported more traffic calming measures. How about in West Windsor? 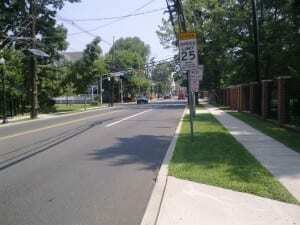 Will merchants support traffic calming on our Main Street, Rt 571? 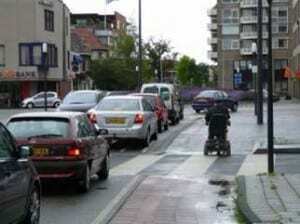 Shared Space: Safe or Dangerous? 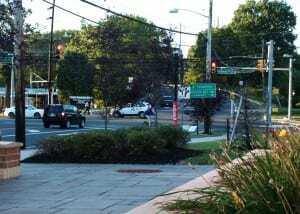 Township Council recently adopted the shared space concept as fundamental to the lawsuit settlement with InterCap over the new Princeton Junction Transit Village. Under this concept, motorists, bicyclists and pedestrians share the roadway as peers. But is it safe? Four European experts reported results of their studies of the shared space experience in the Netherlands in 2007 at the Walk21 Conference held in Toronto. 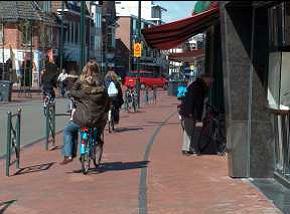 Shared space was implemented several locations between 1998 and 2001, with studies published between 2003 and 2007. The WWBPA supports the shared space concept, but recognizes that to work, all roadway users must be provided with subtle guidance as to the preferred positioning within the space. 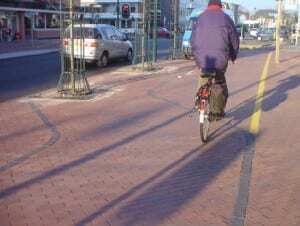 Bicyclists must be encouraged to stay out of the way of opening car doors (the “door zone”), such as through the use of a special color or pattern of pavement to guide where they ride. The current (pre-settlement) language in the redevelopment ordinance calls for buffered bike lanes to achieve this goal. 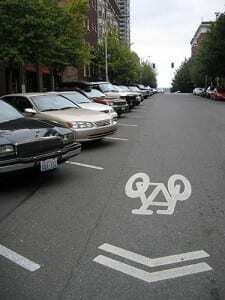 This goal can be achieved in the shared space concept, but the language regarding bike lanes is proposed to be removed. Please contact our public officials with your questions or concerns regarding the safety of our proposed new shared space. Tom Vanderbilt, author of Traffic: Why We Drive the Way We Do (and What It Says About Us), recounts the work of the late Hans Monderman, a Dutch traffic engineer who held to a maxim: “When you treat people like idiots, they’ll behave like idiots.” In appropriate settings, he removed the signs and signals that tell drivers what to do. His goal? “I don’t want traffic behavior, I want social behavior.” His work underlies the design for the promenade in the new transit village west of the train tracks. This realization is slow in coming to our Rt 571 Main Street design, where the state guidelines are in place but the design hasn’t taken them into consideration. 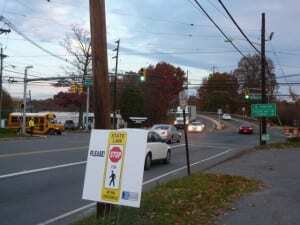 Please help the county engineers learn from the transit village engineers by supporting the WWBPA’s recommendations for Rt 571 Main Street – slower speed, medians with pedestrian refuges and a pedestrian-activated signal that stops traffic at the crossing at Sherbrooke Drive. This redesign is our chance to make drivers comfortable with the slower speed – just posting a lower speed limit will not effectively slow traffic. Our tale of two West Windsors might have the happy ending of a pedestrian-friendly Main Street and transit village promenade, leading to higher property values for us all. 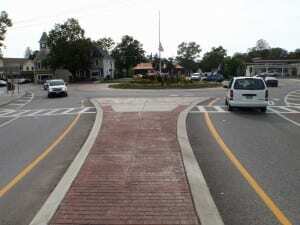 Township Council adopted a new concept Monday night for shared streets, also called a woonerf, for the Princeton Junction Transit Village. 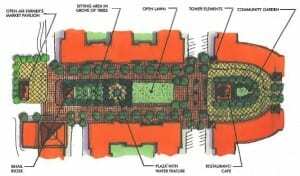 What’s a woonerf, and how does it work? Developed by Dutch traffic engineer Hans Monderman, a woonerf is a street where pedestrians and bicyclists share the roadway with motorists as equals. 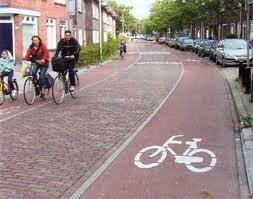 This concept goes by a number of other names, such as Living Streets, Home Zones or shared space. The safety of such spaces depends on extremely slow speeds and one-on-one human eye contact to negotiate movement through the space. Read about one town’s experience with removing traffic lights. The WWBPA made several recommendations to improve the bikeability of the proposed area, including more bike parking at the Farmers Market and in residential parking structures, as well as requiring back-in diagonal parking for improved safety. The WWBPA is confident that this plan, if built as shown in the pattern book, will be eminently walkable, and will provide those bicyclists who are comfortable in traffic with a wonderful place to stop and enjoy the amenities, like the Farmers Market. We are hopeful that motorists, bicyclists and pedestrians will embrace the new shared street and quickly learn to navigate without traditional traffic control. 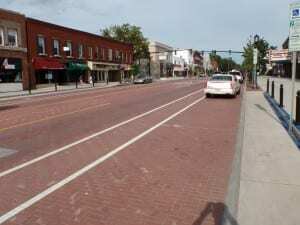 How Can We Tell a Main Street Roadway Design? What is a Main Street and how can we tell a Main Street design when we see it? For West Windsor, this question is important because the county reviewed a Concept Design for Rt 571 in December 2009. Is it a main street design? Excellent so far, but what of the roadway itself? How do we know if the street supports these planned uses, or if it’s pedestrian-friendly? Fortunately for West Windsor, many communities have faced these issues in the past, and based on that experience NJDOT and PennDOT compiled a comprehensive and flexible set of design standards in the Smart Transportation Guidebook, published March 2008. Following is a high level introduction, with extensive quotations. 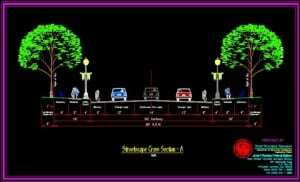 “Desired Operating Speed: This is the speed at which it is intended that vehicles travel. Roadway: The design team should select roadway elements and geometry with a clear understanding of surrounding land uses. Seven land use contexts are described – Rural, Suburban Neighborhood, Suburban Corridor, Suburban Center, Town/Village Neighborhood, Town Center, and Urban Core. Overlaying traditional functional categories, the guidebook describes a typology “which better captures the role of the roadway within the community.” These categories are Regional Arterial, Community Arterial, Community Collector, Neighborhood Collector and Local. • Preferably no more than two travel lanes, although three to four lanes are seen on occasion. Tables are provided which describe the appropriate roadway design standards for each type of roadway and land use context. The WWBPA reviewed the proposed Concept Design for Route 571 against these and other Smart Transportation Guidebook design standards – please read our recommendations published January 2010. 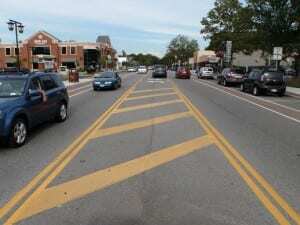 The WWBPA believes the county engineers should consider these design standards in developing a Route 571 roadway that supports our goal of a Main Street for West Windsor. Please support our call for the engineers to review the design against the Smart Transportation Guidebook by contacting our public officials.